SEPTEMBER 11TH: It's more accurate to say that the three Mossad agents were lined up there in New Jersey to be noticed. The point that they knew what was going to happen, is valid, but they were hardly there to document the event in a secretive manner. Neigther were they on Israeli TV afterwards to round off some covert operation. Rather, there is reason to believe that they stood with lit lighters and high-fives in order to be noticed. As a decoy, a diversion, and for subsequent tagging of 9/11-skeptics as anti-Semitic. If they wanted to film the attack on the towers in a secret operation based on secret information that made them able to stand ready with cameras before the first plane hit, it would be more rational to rent an apartment with a so-called window. From this window, they would have been able to shoot all the video they wanted, without being noticed. Mossad is a rational organization, one of the world's finest in their field. It was therefore no accident that this trio was noticed and later arrested and interrogated. Likewise, it was also no accident that it came out in the controlled media that Netanyahu was warned by Scotland Yard before the subway bombings in London. This too was part of the operation, and an item that would discredit 7/7-skeptics as anti-Semites. Also for the 22/7 operation in Oslo and on Utøya, they included a lot of pointers to Israel as a diversion. Not least the date, referring to the start of so-called international terrorism, back in 1946. Israel is a hard nail to criticize in the European and American public sphere. Therefore a lot of clues are included in these operations, pointing precisely to Israel. Interesting analysis. Although where they were spotted hardly seemed to be very public. Admittedly the high fiving and celebrating such an event may have been to deliberately draw attention to themselves. Does seem highly suspicious they were allowed back to Israel so easily given the security clamp down. Doing the high-fiving anywhere outdoors in NY or NJ this day seems to be a very public and very deliberate action. They wanted to be detected, and for this to be a part of the story for this horrible day. Why? You also had the story of the Israelies running around in a white wan with the burning towers painted on it. Also on 9/11 itself. Covert operation? I think not! The undoubted power and influence of the zionist lobby in the US and UK (AIPAC, Friends of Israel, etc). I don't see this as evidence of a jewish conspiracy. I see this as part of global system in which the elite conspire against the many. The elite use Israel as part of its psyop. A distraction. Precisely because any criticism and exposure of Israeli crimes is immediately and without exception is attacked as anti-semitic, it both places Israel above criticism and creates a useful narrative to portray 'conspiracy theorists' as extremists and nazi sympathisers. Add in or plant a few genuine nazi apologists into the mix within the 'truth movement' and you muddy the waters and divide and rule your opposition. Job done. I've been thinking back and forth about this issue, after your comments, and after the comments in the 33K member Face group. Some say Israel controlled everything after JFK. But the JFK II docu hardly mentions Israel at all. Just like Oliver Stone's series on American History hardly mentions Israel. This may of course be censorship, or the fact that Israel doesn't play this massive role, even though a lot of powerful people are Zionists over there. Just as I felt when I wrote this, i still feel now that the #2 story, or backup story, for when the al-Qaida patsy story is no longer credible, ie the «Israel as a decoy» detail, may prove to be an important clue here. I have a hard time figuring out why you would see the «Israel as a decoy» detail in the 9/11 setup, if indeed Israel was the main culprit behind it all. Rather, it seems the real perps have used Zionists and Israelis and Jews in as many roles as feasible, and put on the «Israel as a decoy» show, in order to stall the inevitable truth movement that they knew would emerge, after the JFK assassination. The real power lies with the NATO infrastructure (and NATO media censorship) and the US control over this network. The covert parts of the NATO apparatus (Gladio etc) already provided the perps with a way to carry out these attacks, without reinventing the wheel. Your idea that it could all be a PYSOP is perfectly valid. Assuming that 9/11 was a military planned operation it would have included deception plans of great complexity. 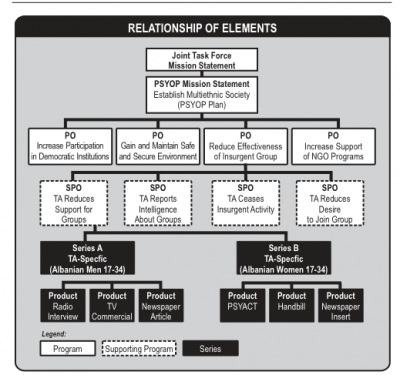 This can only be appreciated by reading the PYSOP Planning Handbook for the US Army. If they go into that much detail for Army Operations you can bet that the Intelligence Agencies have similar planning. Just look at page 13 where they look at three separate channels for propaganda: hostile, friendly and neutral. Or the WARNO's - where they warn their own side of deceptions. And the example outline structure of the PSYOP campaign (in diagram attached). The above is contradictory and why use the word jewish conspiracy. As its not all of them but some of them "Zionist" and I don't mean the land theft of Palestine meaning of it, but New world Order Zionists. Which can be anyone who can be bought out with the evil ideology or even just ignorant of it all. We know (or should do) that the bankers (in the west) are all run by counterfeit jews Askenazi. The false queen is even married to one who had ties with Hitler's regime (that's in the press.) And the not so Royals are Judah which can be traced for thousands of years (even a family tree in Windsor castle.) Not all Judah either. Israel (people who Champion God) any people. Can't have people uniting with a real Jubilee around the world, if you want a New World Order dictatorship. Interesting to me how there seem to be a hierarchy of cult run states - all of whom work together with different roles. Now we come to the Israeli role. "The zionists, and their agents embedded at every level throughout the American and other Western governments, viewed with great interest the formation and manipulation of this global network of Islamic fanatic warriors. Obviously, their use to attack and destroy Arab nationalist leaders and thinkers was in the zionists' interest. More importantly, the use of 'al Qaeda' to replace the Arab struggle for national liberation, which resonated with other national liberation movements around the world, with a movement of sectarian religious fanatics, was "very good for Israel". Thus in the early 1980s was Israel inspired to follow the blueprint with its own contribution, by transforming Hamas from an obscure religious charity into a well-armed, well-financed and well-organized force to attack the then-dominant Left and secular nationalist elements within the Palestine liberation movement. At first, they weren't very successful, for various reasons, then, ironically, when the Israeli plan did succeed, it backfired. We can discuss all that another time. Later on, in the 90s, Ariel Sharon tried to start his own "al Qaeda" cell from scratch in Gaza, but it was exposed in time and turned out to be quite an embarrassing failure for the Israelis. Meanwhile, a network of high-level zionist agents in the United States closely connected to Ariel Sharon and Israel's right-wing Likud, were becoming increasingly anxious about a number of developments that they viewed as highly threatening. First, with the end of the Cold War, pressure was mounting to reduce America's obscenely swollen military budget, which was a huge cash cow for most of them. Also, Israel's own military being parasitically dependent on that of the U.S., it was crucial to them that America continue to invest heavily in military research and development so that the new technology thus developed could be stolen by Israeli spies and transferred to Israel for its own use. Second, the Oslo Agreements appeared to pave the way for a comprehensive resolution of the Israeli-Palestinian conflict, reducing the need for massive military financial and military transfers from the U.S. to Israel, even threatening to divert some of that money into economic aid to the Palestinians. America was also beginning to reap the public relations rewards of brokering the "peace" between Israel and the Palestinians. To a lesser degree, in the aftermath of Bush I's attack on Iraq, in which the U.S. had forgiven tens of billions of dollars in debts to countries that participated in the coalition, the U.S.' popularity among ordinary (deluded) people was the highest it had been since the 1950s. This translated into lucrative contracts for all kinds of American firms in Arab countries. In such an environment, it would be very ill-advised for Israel to try to implement its expansionist agenda into the territories of its neighbors, which would be very difficult to justify. In this context, in the mid-90s, two working papers were issued by right-wing zionist think-tanks, A Clean Break: A New Strategy for Securing the Realm, written for Israeli Prime Minister Binyamin Netanyahu and a Report by the Project for a New American Century, written by most of the same individuals and addressed to U.S. President Bill Clinton. The former is essentially a plan to "cauldronize" the Middle East, with Israel benefiting from the resulting chaos. The latter advocates the further expansion of the U.S.' military budget and arsenal and using its power to dominate the entire globe militarily and economically (full spectrum dominance) "for decades to come". They specifically propose that the U.S. work to shape the global security system according to what these Likudniks claim is the American national interest. "...the process of transformation, even if it brings revolutionary change, is likely to be a long one, absent some catastrophic and catalyzing event––like a new Pearl Harbor"
Thus can one, very important motive for the 9/11 attacks be ascribed to an identifiable group of high-level, very, very well-connected zionist fanatics. Is there a comparable motive for the Saudis to have driven them to carry out the 9/11 attacks? The opposite is true: as I said before, the Saudi rulers utterly depend on the continuous support and protection of the U.S. for their very survival. Unlike the zionists, however, they have no cadres of committed agents embedded at the highest levels within the American media, Congress, the White House, Pentagon and other powerful institutions to ensure an unquestioning, passionate attachment of the U.S. towards Saudi Arabia regardless of what it does. The Saudis know very well that American support is purely a function of their usefulness, and their continued willingness to do what they're told. Second, but by no means secondary, there is an immense profit motive that points to the complicity of a number of specific, very well-placed zionist/Israeli agents in the 9/11 attacks. Unlike the Arab/Muslim patsies, and Arab/Muslim countries who have suffered catastrophic losses as the direct result of the attacks, these zionist/Israeli individuals, and their zionist entity, were pre-positioned to make out like bandits, and they did. I outlined some of this in my post on this page and elsewhere. This brings us to our third important motive: the administration of a massive trauma to the public in Western countries as a means to impose the "us" and "them" paradigm that zionists so relentlessly peddle, with "us" being the civilized, rational, human Whites and "them" being the savage, crazy, inhuman Darkies, the two sides locked in an epic struggle between Good and Evil, against whom all means, no matter how cruel, even sadistic, are justified. The "New Pearl Harbor" made it possible for an unprecedented escalation of the propaganda that has brainwashed even 'good' people in the West to become like "good" Israelis: to accept, even cheer, horrors beyond belief, crimes against humanity inflicted by their governments against helpless people that pose no danger to them. It has paved the way for the ongoing dismantling of human and civil rights legislation that took humanity centuries to develop. Moreover, the "New Pearl Harbor" has opened up opportunities for corruption, pillage and robbery on a scale never before seen, in broad daylight. And it has made dissent immeasurably more dangerous, even in the "freedom-loving countries of the West", all made possible by the War on Terror. For each of these developments, there has been a remarkable correlation between those individuals and organizations who advocate and justify such terrible crimes, and the degree to which those individuals or organizations are committed to zionism and the state of Israel. It's kinda hard to miss, unless one is determined to miss it. Finally, because this is way too long already, in addition to motive, suspects move higher or lower on the list depending on whether they also had the means to carry out the crime, and the opportunity. Is anyone seriously arguing that the Saudis [who had NO motive, unlike the powerful motive(s) of the Israelis], were better equipped and positioned to carry out the attacks than the Likudniks and their American agents? 4) reaping billions and billions of dollars, covering up the theft of trillions before that, not only via high-tech computer crimes and precisely-timed financial transactions, but through billions more in massive insurance pay-offs or "security contracts" related to the subsequent "War on Terror". There's so much more, but I'll stop here. Motive, means, opportunity. The idea that the Saudis collaborated with the Israelis to pull off this zionist fantasy bonanza that has caused them nothing but trouble, with no benefits at all, is laughable and not worthy of consideration. The belief that the Saudis carried out the attacks, whether alone or in collusion with the U.S. government, is a red herring useful for diverting those who see evidence of an inside job. In contrast, mountains of well-documented evidence clearly point to certain specific individuals, linked to the Likud, Netanyahu and Ariel Sharon, who had ample motive, means and opportunity to plan and carry out the attacks, to ensure they were blamed on Arab/Muslims, to cover up or suppress any serious investigations, and to profit massively from them." What I think is that this doesn't change how I view the big picture. Yes there is overwhelming evidence linking zionist fanatics to 9/11 and other high crimes. But these fanatics do not work alone. They conspire with other fascists and NWO fanatics and I'm not convinced their zionism is genuine. The PNAC document is an interesting example. On the face of it (like the high fiving spy ring), this document implicates some of the most prominent of these zionist fanatics. But you have to ask yourself why be so obvious. If you know 9/11 will happen (because you are involved in its planning), why attract suspicion towards yourself by publishing the PNAC document in advance. You know it will be picked up on. My answer (I should say suspicion) is that this was a deliberate ploy to get the inevitable 9/11 truth movement to focus on the role of Israel/prominent zionists. This allows the MSM defenders of the 'official truth' to portray the truth movement as saying that '9/11 is a jewish plot' and the movement is anti-semitic. You know very well that this is precisely what the likes of the BBC's conspiracy files series did. It doesn't matter if the allegation of anti-semitism is overwhelmingly untrue. The slur and the mud sticks. This tactic discourages the wider public from supporting 9/11 truth and as such it has been highly effective. Clearly the PNAC authors and the Israeli spy ring appear to be implicated at the heart of 9/11 and I believe they are. I believe their professed zionism is nothing more than a fabrication, a badge of convenience and that these 'zionist fanatics' are in league with 'non-zionist fanatics'. The purpose of this elaborate charade is to create the conditions that allow for the high-effective anti-semitic slur to be thrown at the truth movement. I could be wrong. Maybe the PNACers and the spy ringers really are that arrogant and stupid as to so obviously sign post their guilt. They wouldn't be the first stupid criminals but as Torstein first suggested ... it all seems way TOO obvious. Ian pretty well sums it up. Case closed. I wish. But you have to ask yourself why be so obvious. If you know 9/11 will happen (because you are involved in its planning), why attract suspicion towards yourself by publishing the PNAC document in advance. You know it will be picked up on. But never the less it's there as evidence and we know they just keep denying what they will anyway. Its said that most know (or at least many do) that Tony Blair is a war criminal, but the establishment keep ignoring that, for example. My answer (I should say suspicion) is that this was a deliberate ploy to get the inevitable 9/11 truth movement to focus on the role of Israel/prominent zionists. Only because you are allowing them to dictate what the word Zionism means, I say it means the New World Order in the bigger picture. And also allowing them to dictate what the word Israel means. "16. In addition and without prejudice to the above, Elizabeth Alexandra Mary Battenberg is a convicted criminal who has been found guilty of Crimes against Humanity, by the International Common Law Court of Justice, sitting in Brussels, and sentenced on February 25, 2013 to 25 years in prison. Please see the attached arrest-warrant. This court must therefore have her arrested and incarcerated, as soon as possible. As a convicted criminal she cannot bring any charges against me." Posted: Thu Nov 14, 2013 4:50 pm Post subject: Thanks for all the research help and opinion! Editor Colleague Bjørgulv Braanen has an editorial on Tuesday, where he claims I have «twisted out opinions» related to the blowing up of the three skyscrapers in Manhattan on a Tuesday in September 12 years ago. In the debate he is referring to, people go even further, shouting allegations at me about ‘jew-hatred’, which typically are not even backed up by any empirical evidence, in the form of quotations or similar. Let me first say that I nurture no hatred for Jews, and I think Trond Andresen’s focus on Jews as a group is both untimely and tiring. As a conscientious objector, I am however skeptical of Israel, the U.S., England, Norway and all other intensely war-fighting states. I also think it's stupid of Andresen to propose to entrust Kristallnacht entirely to MIFF and similar right-wing extremist groups. As regards terrorism, the short version that is I do not suspect Israel for 9/11, 7/7 or 22 /7. The longer version is about a 3 -layer deception. During my work on my novel about the Utøya massacre, published by Glohug.no, I found a pattern repeated in all three of these heinous terrorist attacks. Between the outer layer of patsies and the interior of the actual terrorist planners, these planners seem to have added a «layer of insulation» — a sort of Rockwool intended to prevent the press from penetrating through to the real perpetrators. It is in this middle insulating layer that you have the Israeli Mossad agents filming the towers and giving each other high- fives. It is here that the 2000 plan for a new Pearl Harbor is published online and is still up there. And it is also in this Rockwool layer that Benjamin Netanyahu according to the BBC was notified by the Scotland Yard before the subway attack of 2005, and that Breivik uploads a pro-Zionist manifesto and selects an attack date with the heaviest historical significance for the Zionist terror campaign that resulted in the establishment of the state of Israel. The genius of the middle insulating layer, is that people in the voluntary sector who take the historic mission of the press more seriously than the press itself, freely and easily can be excluded by definition and insulted as anti-Semitic Jew-haters. This in itself will effectively limit recruitment to those communities who want to get to the bottom of the many terrorism puzzles of this new century. A mantra among those who are concerned with so-called Holocaust denial, is that it must not happen again. The sad news is that it is happening again, and in exactly the same way: They use the medium of television — pioneered by Goebbels for this very purpose (hate propaganda), along with the radio medium, and for decades they whip up a contempt and a dehumanisation that is so strong that people now do not care about how many millions of Muslims there may be, who have been «taken out» in the new holocaust. So effective has this racist propaganda been, that Chief Researcher Anton Weiss-Wendt at the Norwegian Holocaust Center can only shrug and say that they have not done any research on these Muslim countries. Exactly like all of his other colleagues at the European Holocaust Centers, who I have been in contact with during this summer. I don't agree with all George Galloway says or represents, but he sure shows how to deal with these accusations.